In my retirement years I’ve decided to take up fishing, partly because I have the time, and partly because I have a beautiful piece of Lowcountry waterfront right in my backyard. Literally. For years I’ve been sitting on our dock watching the fish jump during early morning coffee breaks and on sultry afternoons when friends came over for drinks. So finally, I got tired of people asking me why I don’t fish. My answer was, my father didn’t fish, therefore, I don’t fish. Never really learned how. Finally, I ran out of excuses and decided to dive in. Not so literally. With my trusty Bream-Buster and a bucket full of chirping crickets, I’ve discovered the joy of catching redbreasts and blue gills from the dock. 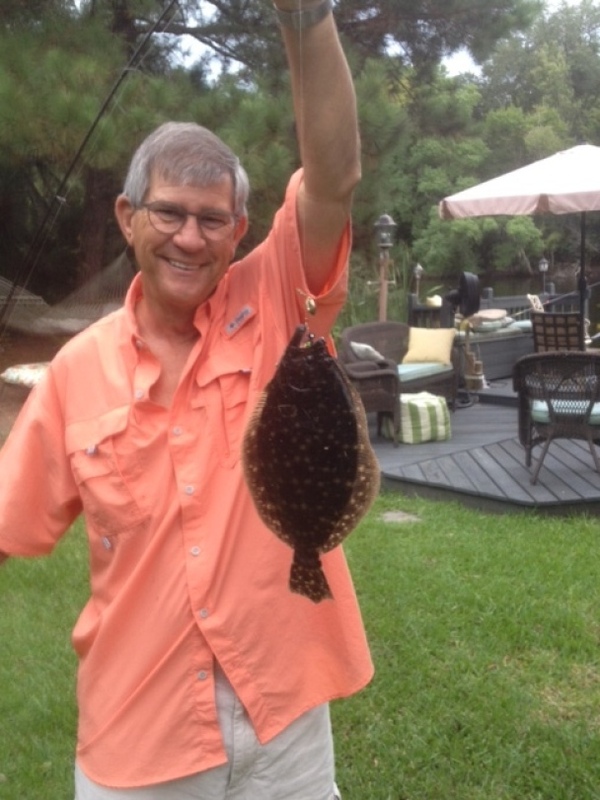 These pan fish are fun to catch and don’t require much of an investment. But I’ve since learned that fishing is like golf – you can never buy enough equipment. So now, in order to go after the bigger fish in the lake, I am the proud owner of a rod, a reel, and a devilish little device called a Beetle-spin. This nifty little lure allows me to cast into the deeper waters and occasionally haul in a red fish or a flounder or two. In case you’re wondering, I live off Glenn McConnell Parkway in West Ashley on a lovely brackish lake that encircles an island and eventually leads up into Church Creek. Those familiar with the area know you can see this water from the highway after you pass Channel 5 TV. But it’s quiet back here and there’s something about sitting for minutes at a time, completely absorbed in the gentle bobbing of a 10-cent cork in the waters of the Lowcountry stillness. Attached is a photo of one of my latest catches. But the real fun is when the grandchildren are here. To them, seeing a fish come up out of that beautiful black water is a miracle of great proportion. Now my fishing friends have only one question – when are you going to stop throwing them back?